I know for a fact this wasn't part of the original MOT plan, and man I think this is going to be a big problem. I guess I'll be avoiding the attractions area for a while. Why would avoid the attractions area for something that is happening downtown? I live just east of downtown off the 408. This would be what I'd have to travel through to get home from the attractions/Millenia area. I was saying it half in jest. I just feel like this is going to cause a huge mess. I'm sure it will. Thanks for clarifying. Makes sense. After spending every other week in Miami, I have to disagree with this list. So as Cody alluded to, coming soon over-nights. . . MOT will not exist! This should get interesting. . . 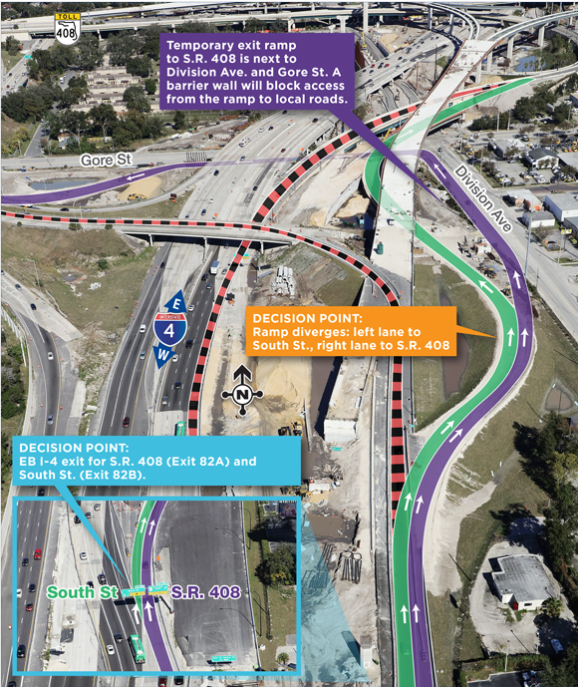 Eastbound Interstate 4 (I-4) from Gore Street to South Street is scheduled to close multiple times in the month of March. These nightly closures will occur from 12 a.m. to 5 a.m. on March 11-15. 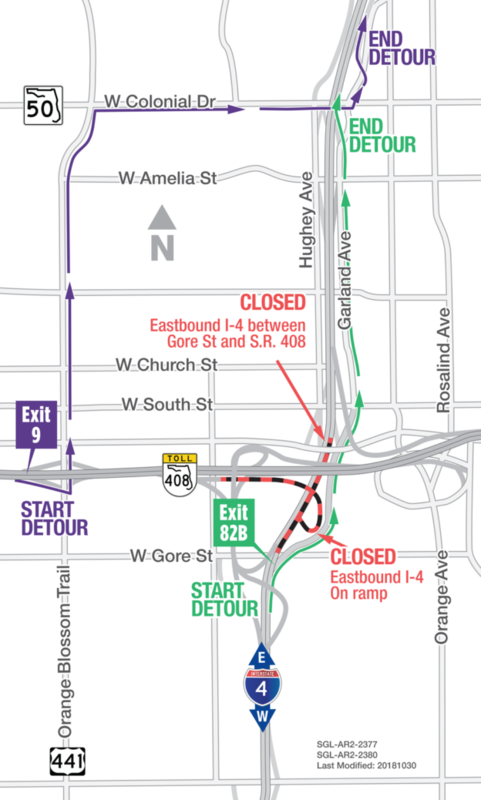 Eastbound I-4 from Gore Street to South Street will also be closing at 11 p.m. on March 28-30 and reopening the following mornings by 5 a.m. These closures are necessary for bridge work at the I-4 and State Road (S.R.) 408 interchange. That is going to be ugly. I have no idea how many cars actually travel EB I4 between 11p and 5 am, but I'm pretty sure its more than what normally travels Garland throughout the entire day. This, btw, is a Friday and Saturday night. Although that is good for some I think it may be problematic for the drunks after last call trying to exit via Garland. Too bad, I thought it was widely agreed Griffin Park needs to go away. "And the whole demolition/moving plan has another snag. There's practically no federal funding, so that means a five to 10-year delay." I would agree about LA; motorcyclists drive on the dashed lines and pass drivers whether driving or stalled during rush hour. Chicago is low b/c they have turn signals on expressway ramps; and, the city proper has a nice urban grid and you can make good headway on LSD or major streets if you time it right. Same with 94/90. Orlando- yeas, there's lots of a-holes on our roads. They will shoot you for merely merging onto I-4. "I'm sure glad we're not in New York City!!!" "Me too!!!" I wouldn't deem lane splitting as aggressive. It's very common in California and a lot of other countries. And I like driving in Manhattan. It's one of the few remaining places in America where people actually go when the light turns green. Lane splitting is illegal in every state except Cali. It’s definitely aggressive driving by impatient, careless bikers. I’ve never been in California long enough to compare idiot bikers but if they’re anything like the swaths of 40-50 morons doing burnouts and wheelies on the 408 or on Colonial while holding up traffic, then they’re annoying AF. Half of those imbeciles are riding illegally and don’t even have license plates. Lane splitting and obnoxious motorcycling are way too common here. On a regular basis I see motorcycles trying to avoid tolls and can't count the number of times I've seen them without plates. I've seen bags tied over plates a lot, as well. I know bikers love to say "it's a few bad seeds ruining it for the rest of us" but since I've lived here in FL I truly believe it is quite the opposite. It seems like a few good seeds can't offset the rest of the bad seeds. The overwhelming majority of bikers on I-4, 408, 436, 528, 417, 520, 429 (all major FL/US roads I use extremely frequently) don't deserve to be licensed drivers on our roads. I come from a family full of past/present motorcycle owners and it is a disgrace to riders everywhere. I called FHP a couple of weeks ago when I was passed on 408 by 4 guys on bikes doing tricks at insanely high speeds. Most glaring from me was I was driving home from work a few years back and I was behind a motorcyclist approaching the fairbanks curve WB. The traffic was beginning to slow to a crawl and I watched the motor cyclist reach back and pull his license plate up so it was no longer visible from behind and then gun it between the cars that were stopped in traffic. It was the most blatant and premeditated act like that I'd witness. He knew he was wrong and could get in trouble, but if he disguises himself the reward outweighed the risk in his opinion. Maybe it's just the thousands of pedestrians that freak me out in NYC. Thursday night bike night, be prepared... The pilgrimage from Osceola county to ace cafe will be full throttle. I wish they'd legalize it, I don't really want to have the motorcycles near me for any more then they need to be. And as shown in California, it doesn't really affect safety at all. Its shocking California of all states is the only one to legalize it. As someone who travels on the 101 from Hollywood to Thousand Oaks daily, I would suggest that the gridlock likely reduces the potential for major safety incidents. Motorcyclists tend to glide through the traffic. That might be a completely different story in a city with less traffic and more opportunity to speed. It's automatic in Thailand and everywhere else pretty much. Why not get them to the front and off and away. Duh.